There were spells when, not for the first time in recent weeks, it appeared that a strong performance from Sheffield United would not receive its maximum reward. But, having survived a late spell of pressure from Norwich City, goals from James Wilson and substitute Clayton Donaldson ensured Chris Wilder's side remained sixth in the Championship table and avenged September's narrow defeat at Bramall Lane. Wilson, making his full debut for the visitors after arriving on loan from Manchester United, justified his selection by firing home from inside the penalty area before Donaldson took full advantage of a defensive error. Although Ivo Pinto ensured United could not enjoy the luxury of coasting to victory - Daniel Farke instructing goalkeeper Angus Gunn to contest a last minute corner - they did deserve the spoils. It was something Wilder, celebrating wildly and pointing to his watch in front of the jubilant away support, was keen to emphasise. Despite making his first senior start of the season, Wilson entered this match in a rich vein of form. The finishing skills which made him Old Trafford's leading goalscorer at development level since August were soon in evidence against United's opponents from Norfolk. Chris Basham wrong-footed City's defence when he connected with an early set-piece and, following an unconvincing clearance, the young centre-forward threaded a low drive both through the crowd and Gunn's outstretched palm. From that moment on, United dominated. Indeed, Wilder's only disappointment will have been the fact the fixture remained alive until the closing stages of the first-half when City began to test the visitors' resolve. 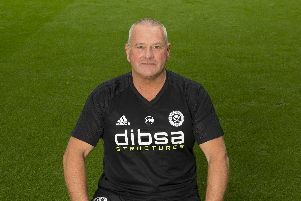 The 50-year-old's decision to break-up his midfield triumvirate of Mark Duffy, John Lundstram and John Fleck might have raised eyebrows beforehand. But with only the latter keeping his place alongside debutants Lee Evans and Ryan Leonard, its wisdom, for today's contest at least, quickly became apparent. Evans, signed from Wolverhampton Wanderers earlier this month, sat deep and shielded United's defence; picking simple but clever passes whenever he seized possession of the ball. Further upfield, Fleck did what he always does while Leonard's energy and presence helped create more space for the excellent Scot. Still, it was a dreadful error from Alex Tettey, whose back pass to Gunn fell woefully short, which presented Donaldson with the opportunity to double United's lead after replacing Wilson. Wilder, becoming increasingly animated on the touchline, must have thought that was that but Pinto, the City captain, had other ideas and converted a looping header which Simon Moore was powerless to keep out. Following Wilder's criticism of Farke's time-keeping when the two clubs met earlier this term, United made sure they arrived on schedule and prepared. It was an approach which translated itself on to the pitch too, with Wilson's effort firing them into a seventh minute lead. City had actually begun in brighter fashion than the visitors, only for their final ball pass to let them down. It was something United nearly punished again after a quarter-of-an-hour when Angus Gunn made a fine double save to deny Leonard. Although having Billy Sharp and Clayton Donaldson at their disposal means Wilson is unlikely to play every single game between now and the end of the season, his partnership with Leon Clarke demonstrated plenty of promise. One interchange, when Clarke flicked the ball backwards into his team mate's path, ended with City scrambling the ball clear and George Baldock blazing high over the crossbar. Josh Murphy, James Maddison and Timm Klose all went close and Farke's men finally began to discover their rhythm during the closing stages of the opening period. But, the second was only minutes old when Enda Stevens unleashed an angled drive which Gunn seemed to think was sailing wide only to hit the post instead. Donaldson calculated his angles perfectly in the 68th minute when Tettey sold Gunn short, sweeping a low shot around the goalkeeper and inside the same upright as he approached the six yard box. Given City's lack of fluency, it was a surprise to see them respond only two minutes later when Pinto's header sailed past Moore from a corner. Hanley (Hoolahan 59). Not used: McGovern, Husband, , Raggett, Cantwell. (Donaldson 58). Not used: Eastwood, Lundstram, Duffy, Lafferty, Holmes.